I've got a number of propagation projects going right now. Really, I could be doing a lot more propagation – I have extra space, and all the materials. I just haven't taken the time to prepare pots of media. Oh well! Let's see what's going on right now. 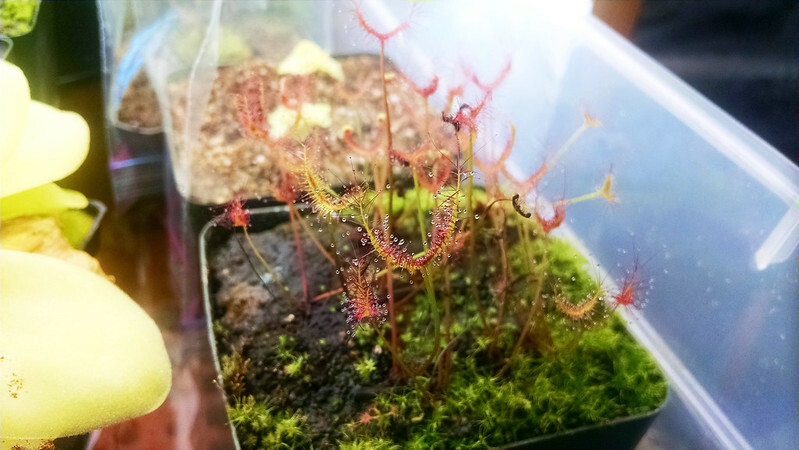 I already discussed my Drosera natalensis and Drosera aliciae seedlings in this recent post. First up, I've begun hardening off the leaf cutting half of the Summer Batch. Boring photo, but exciting development! 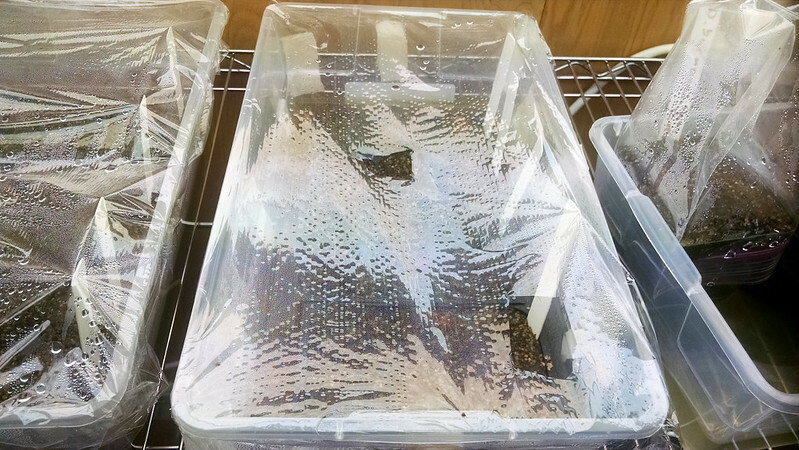 I cut 3 holes into the humidity tent. Gonna leave it like that for at least a week, and then start cutting more. I really want to ease these plants into my ambient humidity. I was able to take a peek at the Drosera adelae at least. The Drosera anglica just behind is really big. They're pretty red! 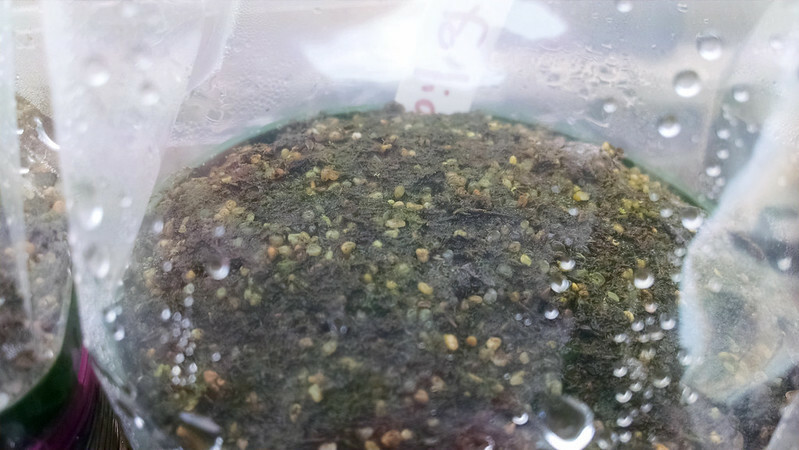 Also fairly small – I'll be able to start feeding these plants once they're hardened a bit more, and we should see some pretty good growth. I'm also starting to think that the seed batch should start getting hardened off. 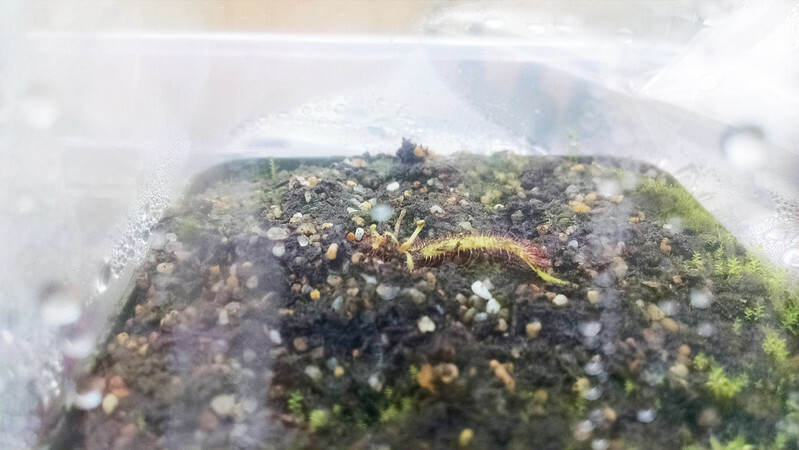 Drosera tokaiensis and Drosera capillaris have germinated, and Drosera burmannii and Drosera intermedia 'Cuba' have not. 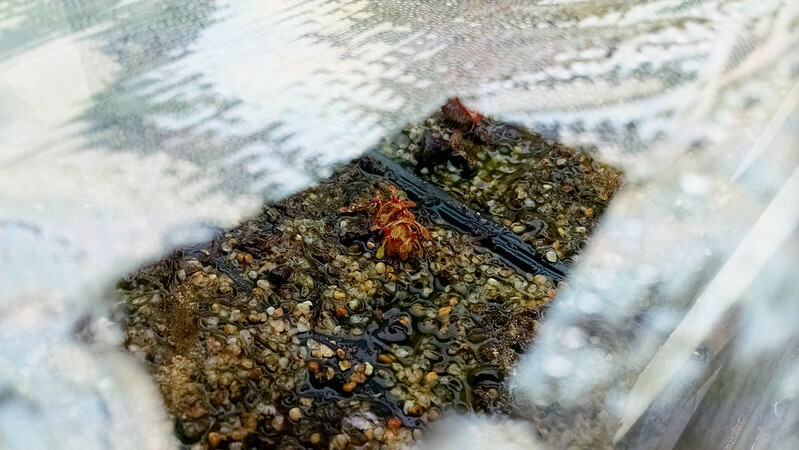 This is especially surprising, because I've already gotten germination from the Drosera sessilifolia seed I sowed one month ago. The germinated seed is a little bit up and left of center. Good luck. I know it's difficult to see, but some of the flecks in that pot are germinated seeds. 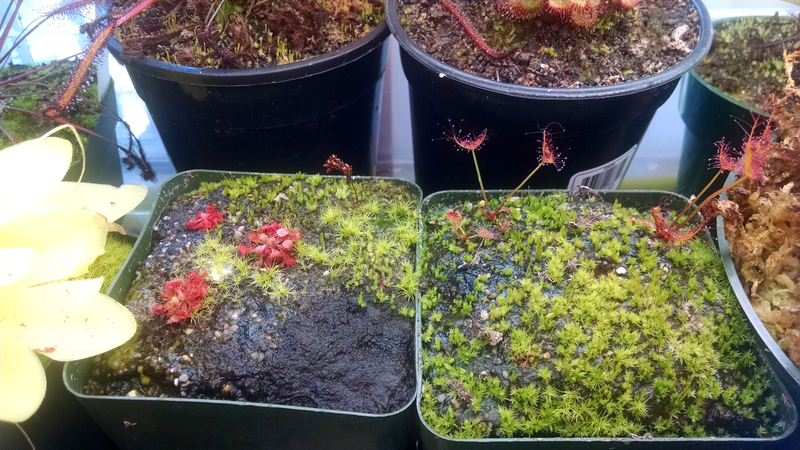 The Drosera capensis (Bainskloof) leaf cuttings I started at the same time are also doing well. Come on little guy, get growing! I believe I also saw a strike on the water-float cutting, but it was too hard to get a picture. 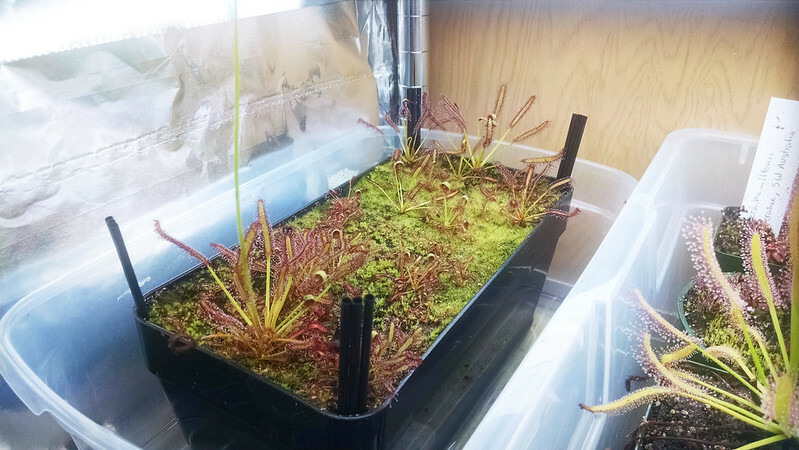 Serious development is underway with Drosera ultramafica x spatulata and Drosera 'Marston Dragon' plantlets. The D. 'Marston Dragon' plantlets have started putting up the tall leaves, rather than the sort of generic rosette they had at first. The D. ultramafica x spatulata are of a size to start getting fed in a serious way. The D. 'Marston Dragon' flower stalk cuttings started out with upright leaves, and they're still chugging along. I've got quite a batch of these going – hopefully they put on some good size before going dormant, and I can separate them out in early spring. Finally, I've got this weird little Drosera capensis windowbox thing I've been working on for the last several months. Now that I have these plants I'm not sure what to do with them! There are some large plants in there, and one has already started flowering. Now I just need to figure out what to actually do with this big box of bug eaters.